With a lengthy list of potential features, often the result of an open brainstorming session, prioritizing what to include in an MVP and what to hold for future launches can be a politically charged endeavor. Remove politics from the discussion by including user input. Kano studies offer a structured way to gather and sort user feedback.What is a Kano Study? A. If your phone automatically placed a call to your mom after 24 hours of not calling her, how would you feel? B. If your phone did not automatically place a call to your mom after 24 hours of not calling her, how would you feel? The way each question of the pair is answered reveals the feature type. A simple matrix allows for easy determination of these types. A response of “expect,” “neutral,” or “tolerate” to the first question, and “dislike” to the second question results in a type of positive feature termed Must-Have. 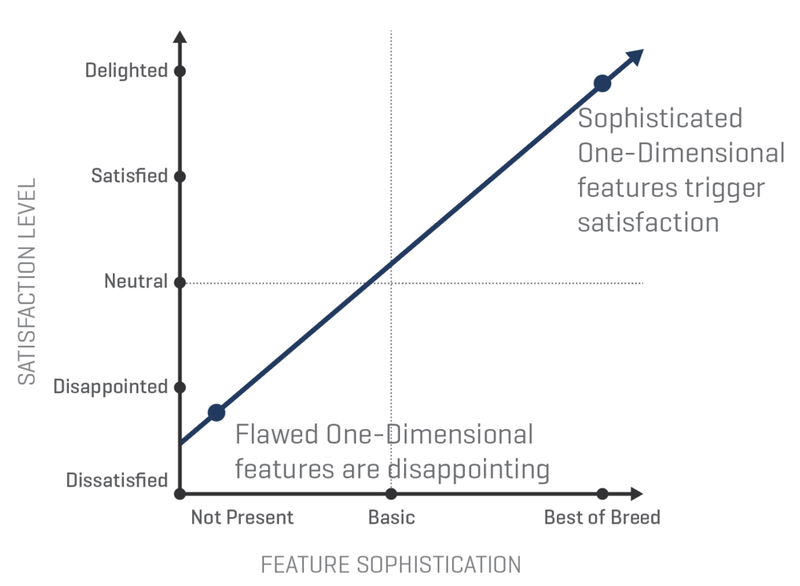 A Must-Have feature has to be in the product as a baseline requirement, but once it is present there’s not usually much value in continually improving, or over delivering, on it. For example, a toilet in your hotel bathroom is expected, and its absence is disliked. You most likely also require it to be clean and in working order, but a hand-crafted artisan painted toilet with mother-of-pearl inlay won’t make you more satisfied – certainly not so much more satisfied that you’re willing to pay more for the room. Attractive features round out the positive categories. They results from a “like” response to the first question and “expect,” “neutral,” or “tolerate” from the second. 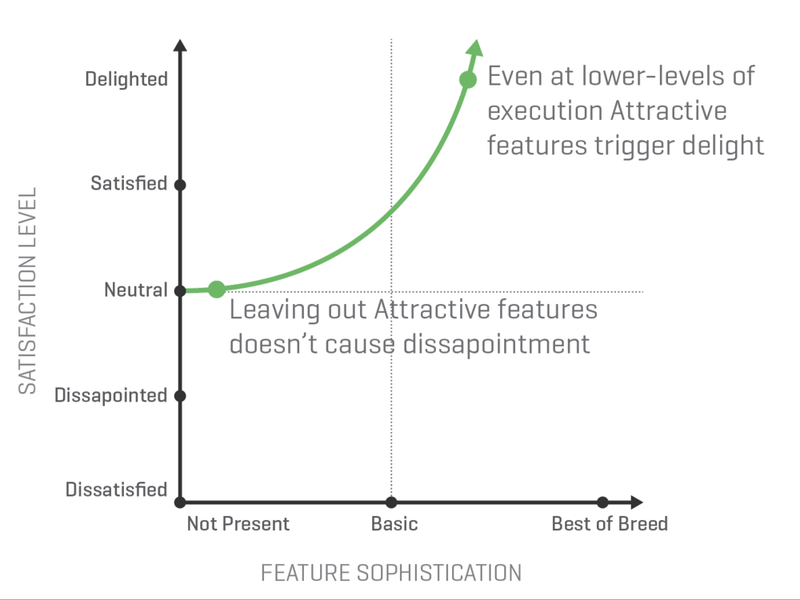 Attractive features are things that users do not expect but are delighted to have. Touch screens on phones were an Attractive feature that delighted users years ago, but that brings up an interesting point: over time Attractive features become Must Haves as users begin to expect their presence. The negative features are straightforward. 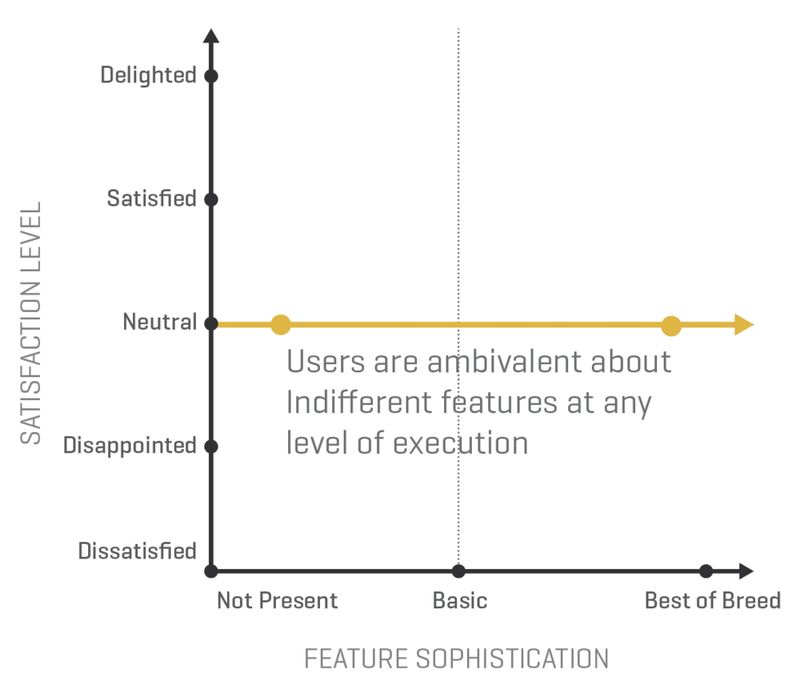 An indifferent features is something users don’t really care about either way (there are no “like” or “dislike” responses to either question in the pair). They won’t pay more for it to be present, and they have no complaints if it’s absent, so it’s best to leave it out. Reverse features are things that users dislike when present or like to have absent. A health care app that automatically posts the results of your latest physical to your twitter account is probably a good example. Sorting potential features into these five categories helps to prioritize and make decisions, particularly when stakeholders are in disagreement. Anytime a product has more features awaiting development than can be tackled efficiently is a good time to implement a Kano study. 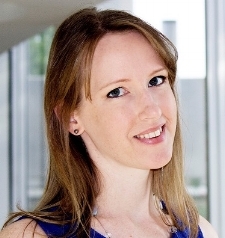 Combined with a qualitative interview it is a powerful tool that tells a compelling story. Can a Kano study help a project you’re working on? Up Next: How adding a qualitative component to your Kano study enhances results.